My friend Michelle turns 30 today. I wanted to do something special for her, so baked her a b'day cake. I was always fascinated by the basket weave cake. Since I'm a novice at cake decorating, I did not really think I could do one. But as I was deciding what cake to bake for Michelle, I thought, why not a basket weave! So I checked youtube and found a few videos on basket weave. Check out this one. After some research, I found tip 47 works best. I used the tip for both the vertical and horizontal lines, unlike in the video where it was used only for the horizontal. The recipe I used for the cake can be found here. I used 1 and 3/4 cup sugar instead of 2, specially because of the sweet buttercream icing that would go around it. I also skipped the almond extract, as I did not have any in hand. As I was blending the eggs into the creamy mixture of butter and sugar, I suddenly thought of making the cake pink in colour. After all, the cake was for a girl and her hubby was planning to get pink balloons anyway, so why not match it? So I added a few drops of pink food colour while blending. And the result was not too bad! I got the buttercream icing recipe from the Wilton's website. I did not want the icing to be too sweet. So I started with 3 cups and added sugar little by little till it reached the desired sweetness. The first two sets of lines didn't come out too clean, I consoled myself that I was doing it for the first time and shouldn't really let that dampen my spirits (and boy, was I high on it!) . But once I got the hang of it, it turned out much easier. I guess I need more practice for both the rope border and the weave, but I was quite satisfied with what I did :). I enjoyed the entire process of baking and decorating the cake, specially 'weaving' the basket. And my friend just loved it! You tried doing the basket weave seeing youtube..? ?minblowing results Aparna..looks great..I am sure your friend must have been happy! 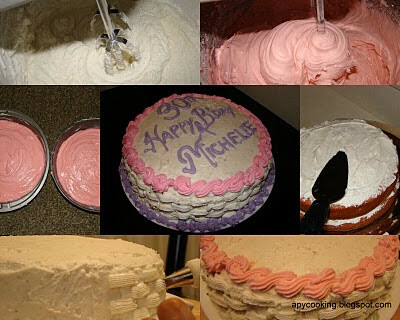 Cake looks perfect & so beautiful..
For a beginner, you did a great job. Hoping to see many more posts on cake decorating.